Cassini captured this mosaic of images showing the northern lakes and seas of Saturn's moon Titan on Feb. 17, 2017. The mission's final close Titan flyby is planned for April 22. The case of the Saturn moon Titan's bizarre "magic islands" has taken an intriguing turn. These strangely shifting island-like features, which NASA's Saturn-orbiting Cassini probe has spotted in several of Titan's hydrocarbon seas, may actually be rafts of fizzing nitrogen bubbles, a new study based on laboratory experiments suggests. The researchers, led by Michael Malaska of JPL, simulated surface conditions on the 3,200-mile-wide (5,150 kilometers) Titan, a frigid moon with a hydrocarbon-based weather system and a thick atmosphere that's 98 percent nitrogen. On Titan, liquid methane rains from the skies, runs down rivers, and gathers in lakes and seas (though some of the latter contain primarily ethane). 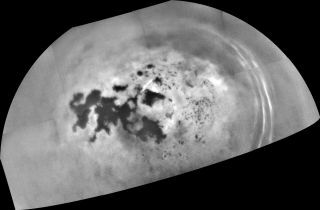 Radar images from Cassini showed a strange island-like feature in one of Titan's hydrocarbon seas that appeared to change over time (series of images at left). One possible explanation for this "magic island" is bubbles. Indeed, Titan is the only solar system body besides Earth known to support stable bodies of liquid on its surface. The experiments performed by Malaska and his colleagues suggest that lots of nitrogen can likely dissolve in the moon's lakes and seas — and that small shifts in pressure, temperature and other variables can send the gas fizzing out, like the carbon dioxide bubbles in a bottle of just-opened soda. "Our experiments showed that when methane-rich liquids mix with ethane-rich ones — for example, from a heavy rain, or when runoff from a methane river mixes into an ethane-rich lake — the nitrogen is less able to stay in solution," Malaska said in the same statement. This two-way movement of nitrogen gas — into and out of Titan's seas and lakes — is probably a common occurrence on the giant moon, he added. These findings seem to bolster the hypothesis that Titan's magic islands — which change shape, disappear and, in at least one case, reappear — are gas bubbles. Alternatively, scientists have also posited that the features may be waves or patterns created by rainfall. The new study, which was published last month in the journal Icarus, could also help inform future Titan exploration efforts, NASA officials said. "A fizzy liquid could also cause problems, potentially, for a future robotic probe sent to float on or swim through Titan's seas," they wrote in the same statement. "Excess heat emanating from a probe might cause bubbles to form around its structures — for example, propellers used for propulsion — making it difficult to steer or keep the probe stable."